A collection of Silly Stanzas I have kept or students have chosen to add from the poetry classes I have taught. These were inspired by some fun poems from a certain book we had in our library. It is a great resource for beginning poets. 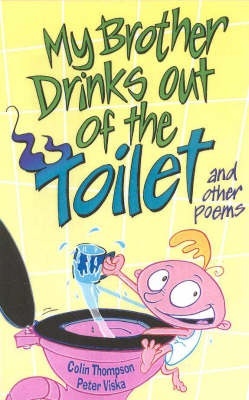 The book is My Brother Drinks Out of the Toilet and Other Poems by Colin Thompson. I wanted something about school so why not a teacher. That sent him on the run. Who liked to play the bass. It sounded out of place. Who tried to act cool. He was an absolute tool. My brothers are just too bad. I was trying to do something funny. Who was obsessed with the loo. Except for doing the number two. He was a bit feral. And burnt in a fire. And buried him under a tree. This is just a quick poem I came up with. She was a big disgrace. And sent her off to space. She lives in a cave. But she’s not worth a save. This is a quick poem i wrote. I think it's funny because i based it on my older sister. But she never wanted to get away i did. So she left in a Mercedes Benz. I did this because I couldn't think of a poem. So I stuck him in a vice. these ones are very funny and good to do if you have trouble with poems . And she said she did a two.